Our Leamington school bus fleet (formerly C.A. Bailey / Southway Buses) consists of more than 100 buses of various types – from wheelchair accessible vehicles to party buses. 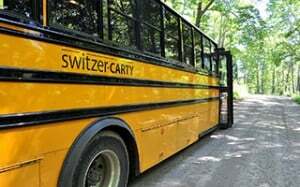 Our professional bus drivers, bus technicians, safety and management Team are best in class. We also operate Leamington Transit services. Our dedication to safe, reliable and on-time bus services have earned us the businesses of district school boards and the public alike. We provide contract school bus services; special needs transportation; and budget-friendly bus rentals for private groups. We also specialize in upscale limousine style service with our complement of air-conditioned coach style party buses. These limo style party buses are perfect for weddings, corporate or other party events. Whether you need a bus for your school trip or a coach bus for your bridal party or company executives – we have a vehicle type to get you there safely and in style! Our Leamington Branch location provides transportation services originating in Leamington and throughout Essex County including Windsor. Our Leamington Management team brings a combined 25 years of school bus industry experience. Karen is pleased to discuss our range of transportation services and how they can help your organization. Whether for your school district, corporation or private group, our team is ready to help. Contact us today! Are you interested in joining our growing Leamington Team that is already 115 people strong? Does the thought of a job for a leading bus transportation company that cares about its people and customers interest you? If yes, then please please apply here now and we’ll quickly get back to you.